If theres one thing you can be sure we are big on in this house...it's hats. We love them so much, we've dedicated a whole wall to them as you enter the house. We rarely leave the house without one whether its a beanie, fedora or even a bowler hat! We've collected our hats from cheap shops to vintage shops and even ordered some to be sent over from American vintage specialists. We are always on the look out for a new hat to add to the collection and to complete our outfit. We love the idea of vintage hats and the story they may of had before arriving on our heads. Earlier last year we came across Peter and his brand 'Hornskov Hats' , he launched a kickstarter campaign to get his brand started which got shared across social media and during that time caught our eye. 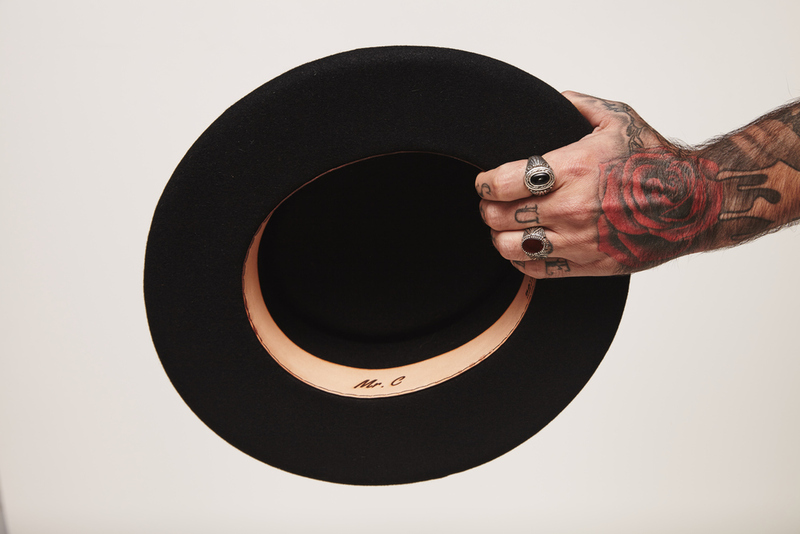 Peter creates custom classic furfelt hats from the finest materials and he will personalise each one with your initials on the leather rim. Later last year, after Carlos had been able to get his hands on his very own Hornskov hat, we both were able to meet up with Peter and his beautiful fiance Catherine at their shop / workshop in Copenhagen to meet the master himself and see how he works his magic. When we arrived though i was blown away with a surprise that both Peter and Carlos had put together, another a black widebrim pencil roll pork pie hat for Carlos and a black western fedora hat for me! Carlos had sneakily taken my hat measurements a few weeks before but i thought nothing off it as he told me he was "just testing how to measure his head" and now i was the proud owner of one of Peters beautiful hats! The best surprise, however, was left till the end as i turned my hat to look in the brim to find it inscribed with 'Mrs C to be' and inside his hat read 'Mr C' - the most thoughtful little surprise and amazing memory and now i can't wait until the day i can get my Mrs C hat to match! Now we had our very own hats with our own little story to tell about them. If you're looking to branch into wearing hats or adding more to an already existing hat collection, we can't speak highly enough of the skill and love that Peter puts into his work. Whenever we get asked where the best place to buy hats is... we always says Hornskov.